I'm only half a month late with this post too! :) I really do apologize for the lack of blog posts lately, you guys. But I have a good excuse...I got married three weeks ago! So obviously things have been busy. (And wonderful!!) I'll try to put up some wedding photos soon. We're settling in, and we have internet at our little house now, so I want to try to get on a somewhat regular posting schedule again. 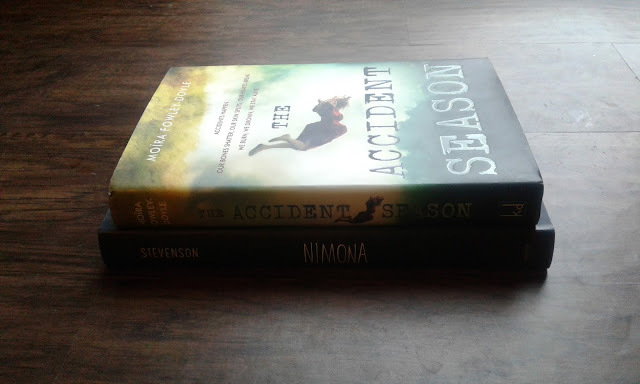 So here are the two books I read in October. One novel and one graphic novel...like I said, there was a lot going on! As always, click on the book title for my Goodreads review. The Accident Season, by Moira Fowles-Doyle. This book was so weird. It was a good read for October, and it was atmospheric and pretty addicting. But overall it was just too weird for me to enjoy properly. Nimona, by Noelle Stevenson. I had heard really good things about this graphic novel. I enjoyed it a lot, but I didn't love it like I had hoped to. It was funny (though not hilarious), and the illustration style was pretty cute. Sometimes it had a bit too much of the typical comic book look for my taste. Congratulations! I hope that the wedding went as planned and turned out how you had hoped - I'd love to see photos!